On the playground in my neighborhood of Essen, an old woman sat beside me on the bench while my daughters and her grandchild played in the sand. We struck up a conversation, and me being me, I asked her if she remembered much from the postwar years. I remember being hungry. All the time. Once my mother sent me to a shop to get apples for my sister and me. Just two apples. I walked all the way home fighting the urge to eat them. I wanted to lie to my mother and tell her the shop ran out. I loved my sister but I was so hungry, I would’ve eaten her share even though I knew she’d cry. 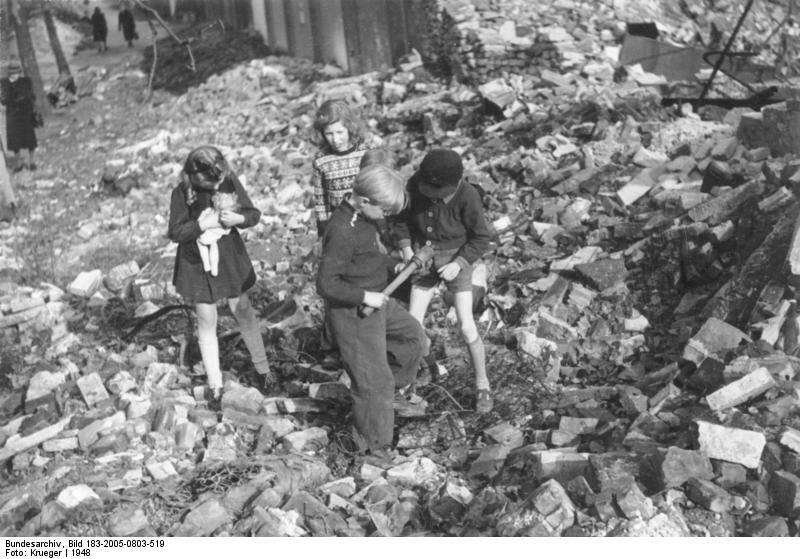 To many people, the only innocents in Germany after the war were the children. Still, they shared the catastrophic living conditions created by the adults. War and postwar children still live with trauma and the memory of shortages, especially of food. a) Babies: Infant mortality in North Rhine-Westphalia was at 8,5 deaths per 100 births. (As comparison, there were 6,1 deaths per 100 births in 1939). Of the babies who made it into the world, many were underweight and often ill. Milk was hard to come by, and the most ruthless black marketeers sometimes added water to milk to stretch it. In the cold months, infant deaths rose also because households didn’t have any coal for heat. Mothers couldn’t bath their children as often as they needed, and cloth diapers couldn’t be washed and dried adequately. b) Preschool children: The Health Office reported these children were in worse shape than they were in 1945. Underweight, easily tired, physically weak, anemic. They fell victim to infections and tuberkulosis. c) School children: They were pale, physically weak, underweight and often had problems in physical development that led to bad posture or gross motor skills. They got sick easily. They had trouble concentrating in school, and on a daily basis, 10 percent of kids didn’t show up to school because they didn’t have proper shoes or clothes. Along with all of the above, teenagers were nervous and apathetic.